Tapestry heads to the USA! 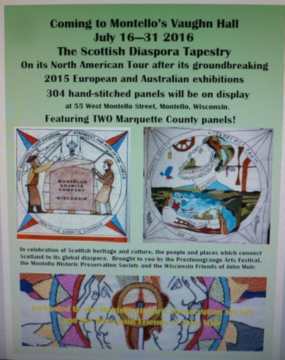 Montello is the next destination for the continuing global tour of the diaspora tapestry. It's the area where John Muir spent his boyhood years after leaving Dunbar .. before he headed to California and worldwide acclaim. One panel tells that story - one of four in total dedicated to his life and achievements. 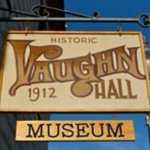 The Montello Historic Preservation Society are hosting the exhibition there at the Vaughn Hall Gallery from July 16th/ 31st. Its visit coincides with Montello's Scittusg Fest, its Scottish Festival - featuring Clan tents, dog herding, dancers and tug-of-war competitions; and with the 100th Anniversary of the US National Parks Service. 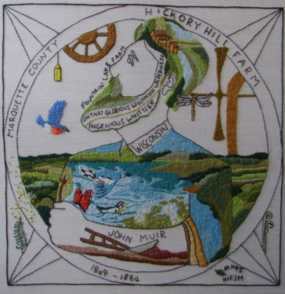 Sharon Beck, from the Prestonpans Team, will be visiting the exhibition to share with the local stitchers who completed the two panels below; and she'll enjoy, no doubt, the exhibition events and the balance of the Festival. US 20: John Muir Stitchers (Marquette County, Wisconsin): Kathleen McGwin, Nancy Kloskowski, Jean Dawidziak, Candy Williams, Linda Mulle, Barb Montes, Katie Dobberpuhl, Montgomery Baker, Christine Benedict, Jacqueline Heinze, Karen Marton, Lisa Melloch, Tiffany Lodhols, Nick Weiss, Karen Weiss, Hazel S Novotny, Eileen Noegel, Pat Wallace, Mary Bornhoeft, Pat Houkohl, Catherine Warrack Willegal, Bev Butcher, Steve Butcher, Laurel Bennett. 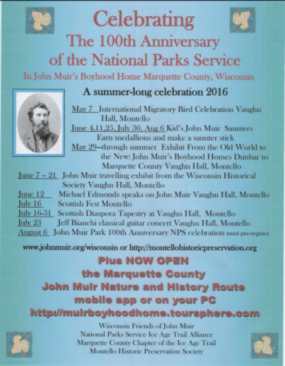 When the family of a young John Muir, later to become the famous naturalist and founder of America's National Park system, migrated from East Lothian, it was to Wisconsin that they moved. In 1849 they set up Fountain Lake Farm. Here he was enthralled by the excitement of the landscape, proclaiming "Oh, that glorious Wisconsin wilderness!" He later recalled the white water lilies on the lake adjacent to the farm - trying three times to purchase the land! John writes several times about the lovely white water lilies on the lake next to his first Wisconsin home and later in his life he three times tries to buy the land with the lake rimmed in lilies with its fern gardens that he recalls so fondly. The nature and the wildlife seemed wondrous to the 11 year old, who marvelled at the dragonflies and fireflies, the blue jays and the "brave little bluebirds". The family later moved to the nearby Hickory Hill Farm. Before his work on the farm began each morning, John used the his free time to create his first inventions. When the ingenious whittler began to show his inventions at the Wisconsin State Fair, it soon became clear that John had an extraordinary talent which would have an impact far beyond the reaches of Wisconsin. Ghluais teaghlach Iain Muir gu Wisconsin ann an 1849 agus chuir iad Tuathanas Fountain Lake air bhonn. An seo, bha Iain air a bheò-ghlacadh leis a’ chruth-tìre, a’ sgrìobhadh às dèidh làimh mu na duilleagan-bathte geala air an loch ri an taobh, na cuileagan-dràgain agus na cuileagan-teine, na steàrnagan gorma agus na ‘brave little bluebirds’. Ghluais an teaghlach às dèidh sin gu Tuathanas Cnoc Hickory, agus mus robh an obair tuathanachais a’ tòiseachadh sa mhadainn bhiodh Iain a’ cur seachad a thìde a’ cumadh a chiad innleachdain. Bhiodh an “ingenious whittler” gan taisbeanadh aig Fèile Stàit Wisconsin agus thàinig e am follais glè luath gun robh tàlant air leth aige. From the start of quarrying the rich, red granite hill in the centre of Montello, Wisconsin in 1881, Scottish workers played a large role. The first granite quarry company sent for 125 “marble workers” and polishers from Scotland. 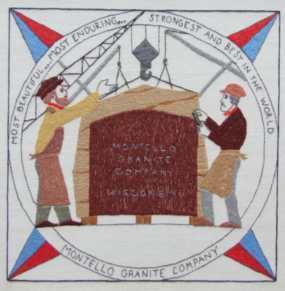 Names like Andrew Rae, Robert Harper, and John Robertson, all Scots arriving in the early 1880s, helped make the famous Montello granite internationally known and highly valued. Monuments around the US are made of this granite including General Ulysses S. Grant’s sarcophagus and a monument at the Custer National Cemetery. Bho thòisich cuaraidheachd air a’ chnoc shaibhir cloich-ghràin dhearg ann am meadhan Montello ann an Wisconsin ann an 1881, bha luchd-obrach Albannach aig fìor theis-meadhain na cùise. Chuir a’ chiad chompanaidh cuaraidheachd clach-ghràin air tòir 125 “luchd-obrach màrmor” agus luchdlìomhaidh à Alba. Chuidich ainmean mar Anndra Rae, Raibeart Harper agus Iain Robasdan, uile nan Albannach a ràinig tràth sna 1880an, le clachghràin Montello a dhèanamh aithnichte agus ainmeil agus air àrd-luach, gu h-eadar-nàiseanta. Tha carraighean-cuimhne air feadh an US dèante às a’ chloich seo a’ gabhail a-steach na ciste-laighe cloiche aig an t-Seanalair Ulysses S. Grannd agus carragh-cuimhne ann an Cladh Nàiseanta Custer.